Blurry picture, but…best mail day ever. I thought about doing a giveaway because that’s what the good bloggers do, but then I realized that a giveaway would mean sharing my Larabars. Maybe some other time. They also included a request form for my local grocer. You’d better believe that the Wal-Mart manager is getting that sucker ASAP. Why I’m so Larabar-obsessed? Let’s look at the carrot cake flavor, because that’s the one that I’m currently shoving down my gullet. (I didn’t know there was a carrot cake flavor until yesterday. Spoiler alert: It’s delicious). Here are its ingredients: Dates, almonds, walnuts, raisins, pineapple, unsweetened coconut, carrots, cinnamon, extra virgin coconut oil. Anything on that list you don’t recognize? Nope, I didn’t think so. And just for fairness, since I used two other chocolate examples, here are the ingredients from Larabar’s Chocolate Chip Brownie flavor: dates, Fair-Trade Certified chocolate chips (unsweetened chocolate, sugar, cocoa butter, vanilla), almonds, walnuts, cocoa powder, sea salt. Which list of ingredients would you rather put in your body? I choose the pronounceable ones that don’t take up half a page and that I actually have in my own pantry. I don’t think anyone can complain about those stats! It’s a Colorado company. The founder came up with the idea for Larabars on a hike. They are gluten-free, dairy-free, soy-free, non-GMO, vegan, and kosher. Basically, unless you have a nut allergy, you can eat these. Just in case you haven’t figured this out…THEY’RE FLIPPIN’ DELICIOUS. And filling. Definitely a staple while I’m marathon training and constantly ravenous. And that is the end of my Larabar online lovefest. 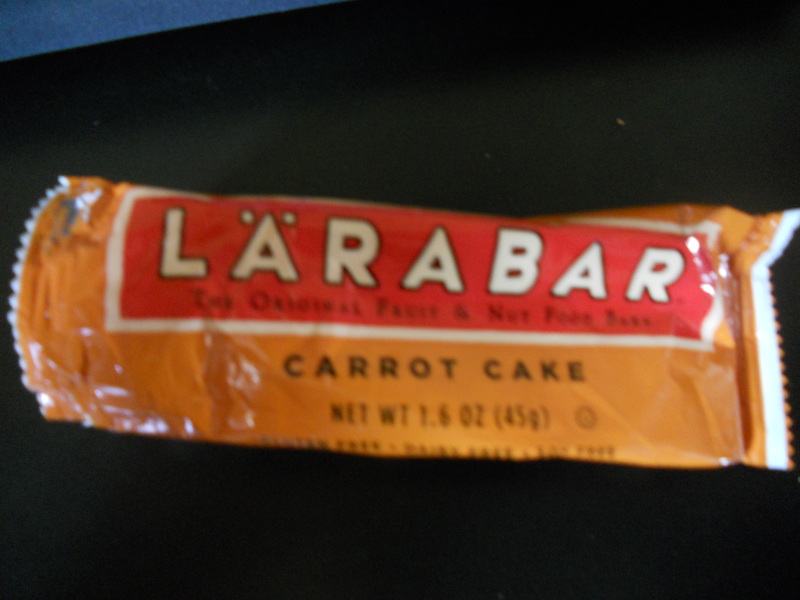 And of my carrot cake Larabar. (It never stood a chance). Do you like Larabars? If not, we probably can’t be friends anymore. 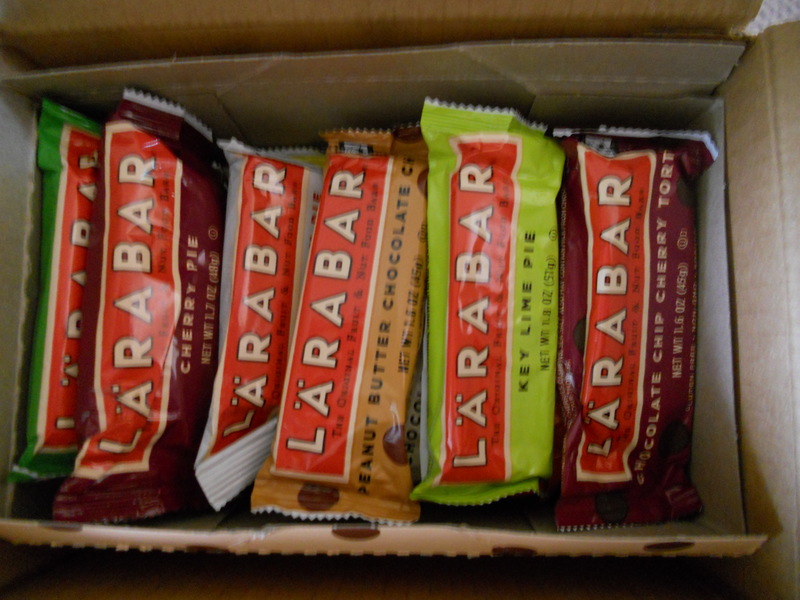 Local folks: If Wal-Mart keeps stocking them, would you buy Larabars? Please say yes. To me and to the Wal-Mart people. What’s your favorite non-Lara bar? Katie and her colleague at Larabar sent me these out of the goodness of their hearts. They didn’t ask me to do a blog post, but I wanted to share the Larabar love. So to recap and make sure I understand, you like Larabars? Just want to make sure. Can’t say I have had one. Can we still be friends if I am willing to try one? If the answer is no, my rebuttal is this: I tried tofu for you! This meat eating, would eat steak everyday of her life if she could cook it and afford it, girl tried tofu. To answer the question, I have recently found Sunbelt (?) bars. I can’t remember for sure what they are. Who knows what they have in them, but because of you I will check next time! I tried a few Larabars when I was in Colorado – they donated some for an event we were putting on. I didn’t fall in love with any, but they definitely didn’t send the carrot cake one! I love the concept of the company, that it’s Colorado-based and the ingredients list, so I’m still open to giving them some more chances =). So sweet that they sent you some! Sometimes I feel the same way about giveaways, ha. I got an REI gift card once and was totally going to give half of it to my readers, and then changed my mind…oops. Hahhahaha- “I thought about doing a giveaway because that’s what the good bloggers do, but then I realized that a giveaway would mean sharing my Larabars. Maybe some other time.” thats brilliant, well said! i LOVE the carrot cake lara bars. i could eat them all day long 🙂 also the coconut ones are amaaaazing. The chocolate coconut ones are even better than the regular coconut. Yum! First Matt Fitzgerald, now Larabars…. You are broadening my horizons lady! Love, love, love Larabars! My favorite? Has to be the Chocolate Chip Brownie. I mean how can you go wrong with chocolate and more chocolate? Love Larabars! My favorite flavor is apple pie! My least favorite flavor is cashew cookie… it’s just boring. I buy Larabars in bulk at Costco but they only have three flavors. I really need to try the key lime Larabar.